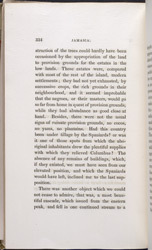 Extract from Cynric Williams' 'A tour through the Island of Jamaica, from the Western to the Eastern End, in the Year 1823.' Here Williams writes about an expedition to the peak of the Blue Mountains which he made with Mr M'Whinney. Their provisions were packed and some members of the enslaved workforce were appointed to carry the bags and to act as guides. The travellers crossed valleys and hills thick with foliage as well as beautiful rivers but were forced to turn back because of the wild landscape and the oppressive heat.